In the grounds of the owner's smallholding in the hamlet of Clapton Wick. Set between the historic towns of Clevedon and Portishead making it ideal for both business or pleasure. 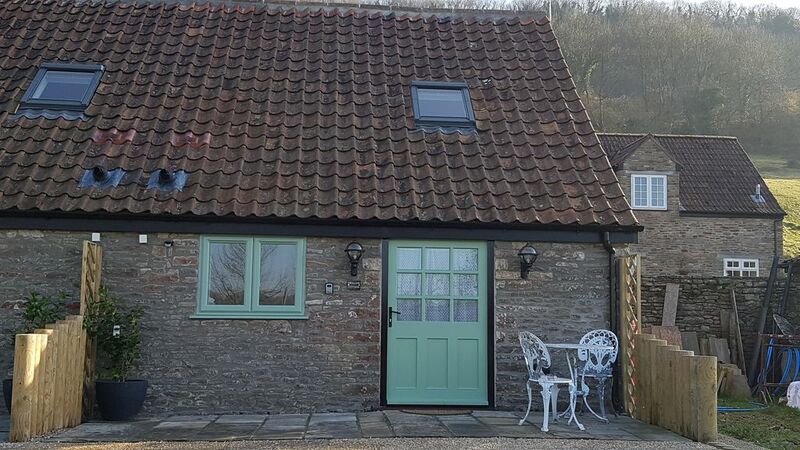 This fully insulated recent barn conversion provides a modern living space with impressive vaulted ceiling, open plan lounge/diner/kitchen, spacious en-suite bathroom and lovely bedroom. It boasts all the conveniences of gas central heating, a fully equipped kitchen with built in fridge with ice box, dishwasher, induction hob, electric oven and microwave. The lounge has a comfy sofa and wall mounted TV. Outside there is a patio seating area and level access to private car parking. Require more beds? Why not try our other property - Deer Cottage. Clevedon M5 J20 (2 miles) is a Victorian coastal town, with historic pier, children's railway and donkey rides are available in the summer. Recently made famous by the filming of BBC series Broadchurch and the One Direction music video for You and I. Portishead M5 J19 (3 miles) has a number of restaurants centred around the impressive Marina. The more energetic Weston-Super-Mare M5 J21 (10 miles) offers wide sandy beaches, amusement pier and aquarium for year round entertainment. If you prefer walking or cycling, the valley has many woodland paths and bridleways offering access to the Iron Age hill fort, breath taking views over the Bristol Channel, Wales and Somerset levels and if thirsty, the traditional old English scrumpy pub - The Black Horse. The university cities of Bristol and Bath are also close by with their diverse range of shops, restaurants, museums and historic sites. Avon & Somerset Police and Fire HQ is located on the opposite side on the valley, other major employment centres include Avonmouth, Aztec West and Filton. Transportation connections are excellent. Bristol Airport (10 miles), Main line stations: Nailsea and Backwell Train station (6 miles), Yatton station (6 miles) and Bristol Temple Meads (10 miles). There is a small supplement of £4 per night for dogs should you wish to bring your pet. A selection of board games is available. Grass and access to paddock and fields. Patio outside with table and chairs. Quite possibly the nicest holiday rental I've stayed in. Lots of thoughtful extra touches. Extremely high quality equipment and fittings. Very well soundproofed between the two cottages. Beautiful and tranquil location, with an easy drive to the coast. Ideal bolthole to relax when visiting family in Bristol. Liz and John were very welcoming and on hand if required. Perfect location and great cottage . Liz was great and showed us around the cottage with lovely touches like bread, milk, cereal , tea and coffee, all we had to do was put the kettle on!! Amazing location for walking and a short drive to the beach. It was perfect and we will be back. The perfect place to stay. The cottage had everything you need and more! Perfect rural setting, delightful cottage with very thoughtful owners. All this and more makes Swallow Cottage the ideal place to stay with your fur babies.